Our journey across the Pacific Ocean took three years, from March 2003 to April 2006. 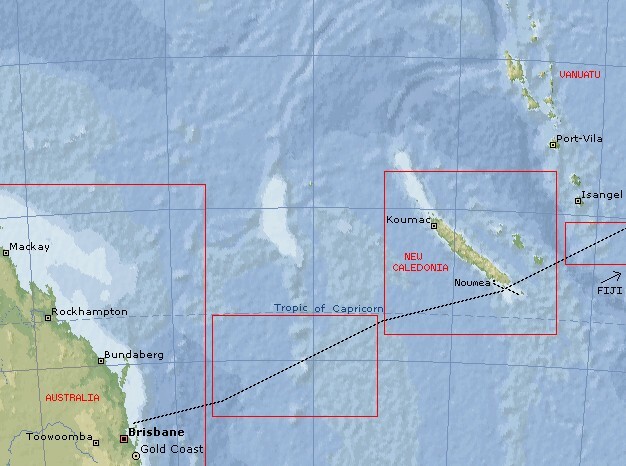 We sailed to: Ecuador & the Galapagos Islands; the Marquesas, Tuamotus and Society Islands of French Polynesia; Tonga; Fiji; New Caledonia; and finally Australia. This page is in chronological order, so the most recent maps and synopses are at the bottom. Click on any of the highlighted sections of the maps to go to that page. 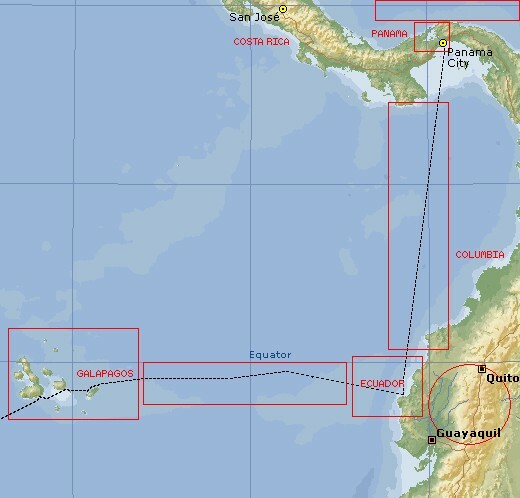 After we transited the Panama Canal (March 2003), we sailed down the coast to Ecuador, where we explored inland for several days. From there we sailed to the Galapagos for a month before starting our long passage to French Polynesia. We stayed in the Marquesas a while, then sailed to the Tuamotus, where we enjoyed the beautiful atolls for over a month. About that time we started thinking of a trip back to the states, and sailed to Tahiti to get everything set up. Grid‑lines on both maps are 5 degrees (300 miles or about 500km). 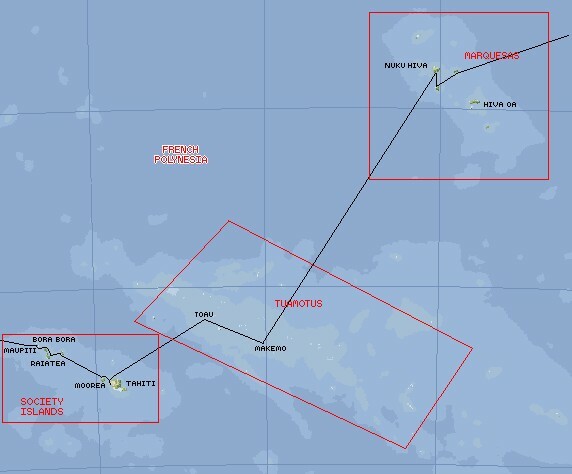 Hiva Oa is just above the 10 degree south Latitude line. Our journey across the South Pacific resumed in January of 2004, when we flew back to Tahiti and Ocelot. The next four months we spent sailing in the Society Islands - often with friends aboard - from Tahiti to Maupiti by way of Moorea, Huahine, Raiatea & Tahaa, and Bora Bora. In May, the beginning of the non‑cyclone season, we jumped off for the Kingdom of Tonga. We spent four and a half months there, exploring the green Vava'u and white‑sand‑beach Ha'apai Groups. At the end of September, with many sad farewells to all our friends in Tonga - cruisers and people ashore - we headed off to Fiji, the land of curries. The lines on the bottom map are every 2 degrees (120 miles, or about 210 km). Sailing between the Vava'u and Ha'apai groups is a long day sail (about 70nm). 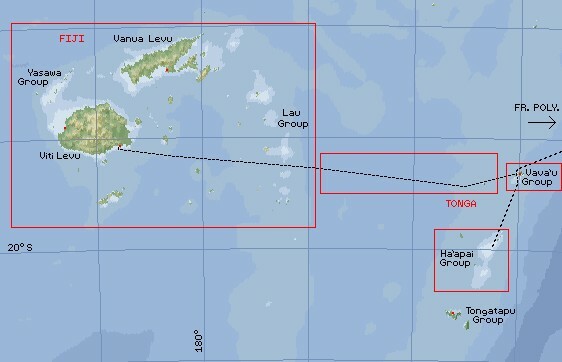 The sail from the Vava'u Group to Suva is about 450 nm, and took us 3 days. We spent an entire year in Fiji. The first three months we were in the east, alternately in Suva and Savusavu (South Vanua Levu). In January we sailed over the top of Viti Levu, to sail in the Yasawas and Mamanucas with Jon's dad, Colin, and niece, Rori. In late March 2005 we left Ocelot in the Mamanucas and flew home to the States for two months. When we flew back to Fiji, Chris stayed in Washington to pursue higher education. We sailed around Fiji until September 2005, visiting the Kadavu Group (south of Viti Levu) and spending more time in the west. Finally, as our visas ran out and the flood of yachties started coming through, we left Fiji to sail west once more. We didn't get to Vanuatu as we'd planned, due to timing and malaria fears. Instead, we arrived in French New Caledonia in early October 2005, and to our chagrin only stayed for a month. During our stay we had a wonderful time, however, exploring Noumea, sailing the lagoon (the second largest in the world), visiting the Isle of Pines and the western reef, and eating French baguettes and cheese. Early in November 2005 we headed off for Brisbane with two other cruising boats, arriving a week later. Ocelot stayed in Brisbane for 5 months.